Here the XDMF3 Model and Format is described. See Xdmf2 Model and Format Archive for the previous version. The need for a standardized method to exchange scientific data between High Performance Computing codes and tools lead to the development of the eXtensible Data Model and Format (XDMF). Uses for XDMF range from a standard format used by HPC codes to take advantage of widely used visualization programs like ParaView and EnSight, to a mechanism for performing coupled calculations using multiple, previously stand alone codes. The eXtensible Markup Language (XML) format is widely used for many purposes and is well documented at many sites. There are numerous open source parsers available for XML. The XDMF API takes advantage of the libxml2 parser to provide the necessary functionality. Without going into too much detail, XDMF views XML as a "personalized HTML" with some special rules. It it case sensitive and is made of three major components: elements, entities, and processing information. In XDMF the element is the most important component. Additionally XDMF takes advantage of two major extensions to XML: XInclude and XPath. XML is said to be "well formed" if it is syntactically correct. That means all of the quotes match, all elements have end elements, etc. XML is said to be "valid" if it conforms to the Schema or DTD defined at the head of the document. For example, the schema might specify that element type A can contain element B but not element C. Verifying that the provided XML is well formed and/or valid are functions typically performed by the XML parser. The organization of XDMF begins with the Xdmf element. So that parsers can distinguish from previous versions of XDMF, there exists a Version attribute (currently at 3.0). Any element in XDMF can have a Name attribute or have a Reference attribute. The Name attribute becomes important for grids while the Reference attribute is used to take advantage of the XPath facility (more detail on this later). Xdmf elements contain one or more Domain elements (computational domain). There is seldom motivation to have more than one Domain. HyperSlab - contains two data items. The first selects the start, stride and count indexes of the second DataItem. Coordinates - contains two DataItems. The first selects the parametric coordinates of the second DataItem. This DataItem is a tree with three children. The first child is another tree that contains a collection of two uniform DataItem elements. The second child is a collection with two uniform DataItem elements. The third child is a uniform DataItem. Notice that the first DataItem specified Start, Stride and Count for each dimension of the second DataItem. Suppose, instead that we only wish to specify the first Y data value from the DataItem and the last X value. This can be accomplished by providing the parametric coordinates of the desired values and using the Coordinates ItemType. The first Y value is index 1 of item 0,0,0 while the last X value is index 0 of item 99, 199, 299. The dimensionality of the specified coordinates must match that of the target DataItem. <!-- Select 2 cells from another grid. Mixed Topology Cell Number *Needs number of cells. Mixed topology enables to define a mixture of unstructured cells (see picture to right). A cell defined in a mixed topology is made of a type (integer) and a list of associated data (integer) describing the cell. The list of data describing each cell depends on the cell type. If the cell is neither a polygon nor a polyhedron, the list of data describing each cell is the list of indices of each node of the cell. The connectivity defines the indexes into the XYZ geometry that define the cell. In this example, the two quads share an edge defined by the line from node 1 to node 2. 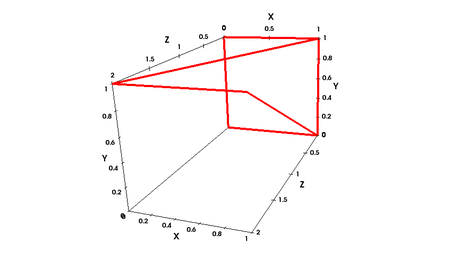 A Topology element can define Dimensions or NumberOfElements; this is just added for clarity. Here NumberOfElements defines the number of cells we have (3: 1 Tet, 1 Poly, and 1 Hex) and the dimensions denotes the total number of items used to describe the topology (total of 20). The BaseOffset attribute for specifying connectivity indices starting at a value other than 0 (e.g., the default starting array index in Fortran is 1) was available in the original XDMF implementation but is not available in XDMF3. The Attribute element defines values associated with the mesh. There are three attributes which defines what type of data is associated with the mesh. A Grid centered Attribute might be something like "Material Type" where the value is constant everywhere in the grid. Edge and Face centered values are defined, but do not map well to many visualization systems (ParaView, for example, ignores them at present). Edge and Face values are defined for each Cell in turn, using VTK ordering. The same Face or Edge may be visited multiple times, with duplicate values. Other centered attributed is currently used only with FiniteElementFunction ItemType. FiniteElementFunction has data centered on nodes, midpoints, centroids, etc. and combination of them. For this reason the centering is called Other. First DataItem defines indices to degrees of freedom values. These are cell-wise indices to the second DataItem array. VTK ordering of nodes is depicted in VTK "File Formats" manual. XDMF ordering is inspired with finite element code FEniCS (www.fenicsproject.org and femtable.org). There are 8 cells on which the function is stored. From the first DataItem we can see, that for the first cell first three values for degrees of freedom are on indices 3 6 4 of the second array. They take values 0 0 0.25. Because the function family is CG and degree is 1 we know, that these values are values of piecewise linear function on triangle's vertices. The ordering of these values is the same as VTK ordering, if it wasn't we would need to apply permutations defined above. Unlike in the AttributeType="Scalar" case the function has now 6 values of degrees of freedom per each cell. It corresponds to two components of each of three nodal values. There are 6 degrees of freedom indexed 6 12 8 7 13 9 with values 0 0.5 0.5 0 0 0.5 for the first cell. 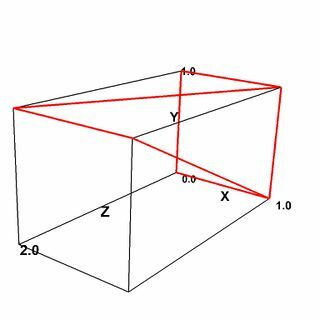 Because AttributeType="Vector" and mesh has topological dimension 2 we expect vector to have 2 components. These 6 values iterates first through nodes, then through vector components. It means that that function has values (0, 0) (0.5, 0) (0.5, 0.5). The Set element may be used to define Attributes on a subset of entities of a Grid. Set may have multiple DataItems. The last DataItem always provides the indices of the entity. If SetType is Face or Edge, the First DataItem defines the Cell indices, and subsequent Dataitems define the Cell-local Face or Edge indices. It is therefore possible to define multiple values on Edges or Faces. The following example defines values on Face 0 of Cells 1,2,3 and 4. The Time element is a child of the Grid element and specifies the temporal information for the grid. Xdmf3 only supports a single time value for each grid. Older versions allow use of different TimeTypes. Default values are shown in red. This page was last modified on 14 July 2018, at 10:20.